Watch Holly Grow | Go. Do. Be Dog. 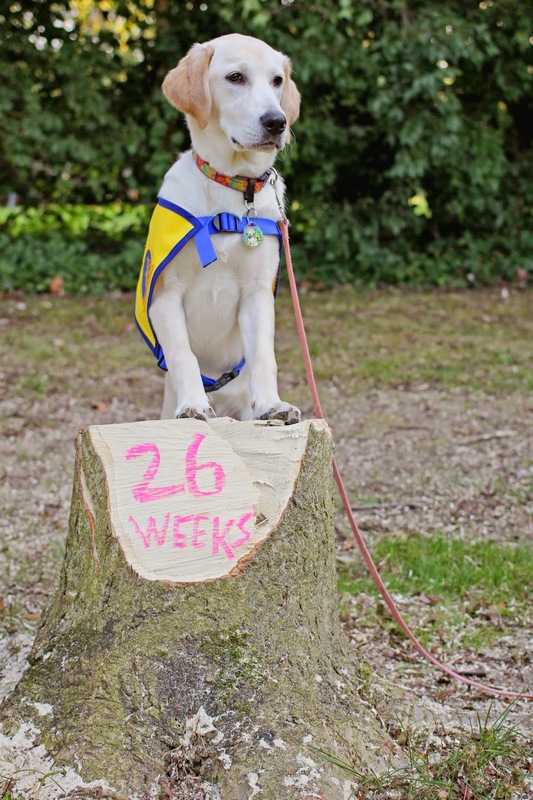 A slightly belated birthday to the Canine Companions for Independence Hero Litter. 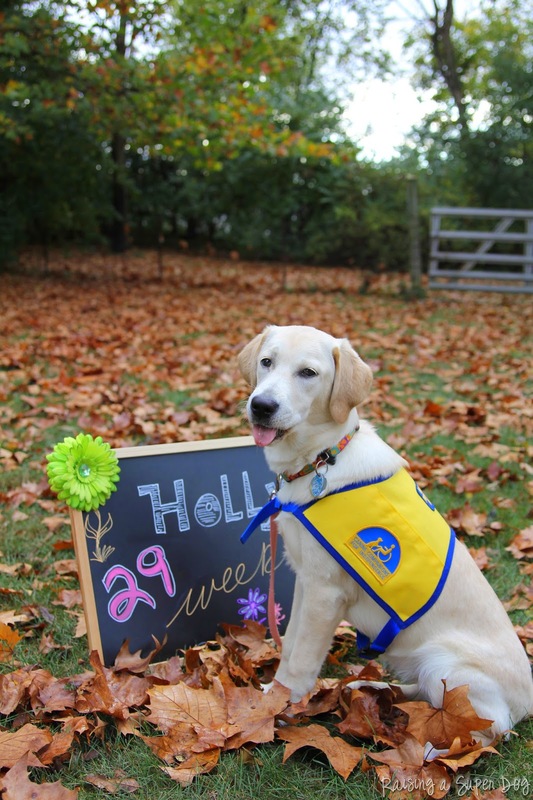 Holly and her littermates should have received a hearty Happy Eight Month Birthday greeting a few days ago on November 18. But the day came and went without a peep from us here. Kind of like the movie Sixteen Candles, but without all that teenage awkwardness. 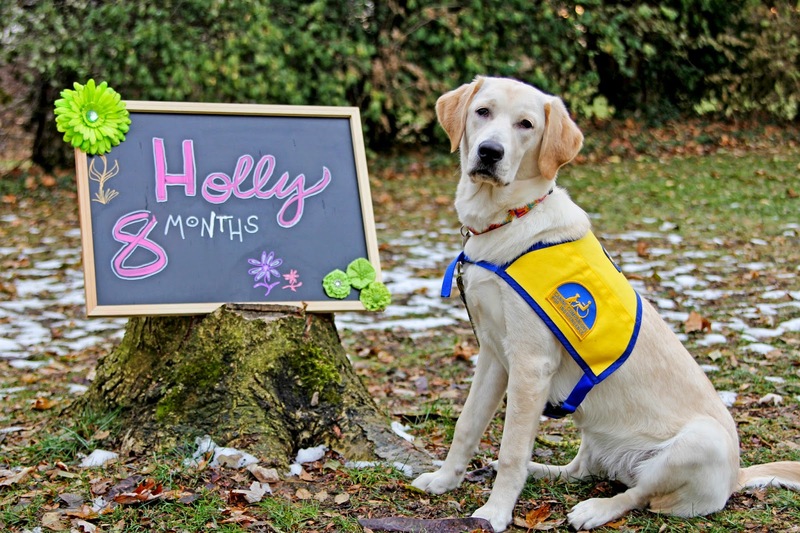 Because there’s nothing awkward about Miss Holly now. Just look at her surrounded by her aura of grace and poise. Sure, mostly nothing awkward. Do take notice of those back legs of hers, willya. What brought this posture about? The chilly earth? Emulating a roast turkey in advance of the upcoming holiday? The desire to comply with the Sit command real good now? Maybe simply a reminder that, at eight months old, Miss Holly is still a puppy. Just in a bigger body. 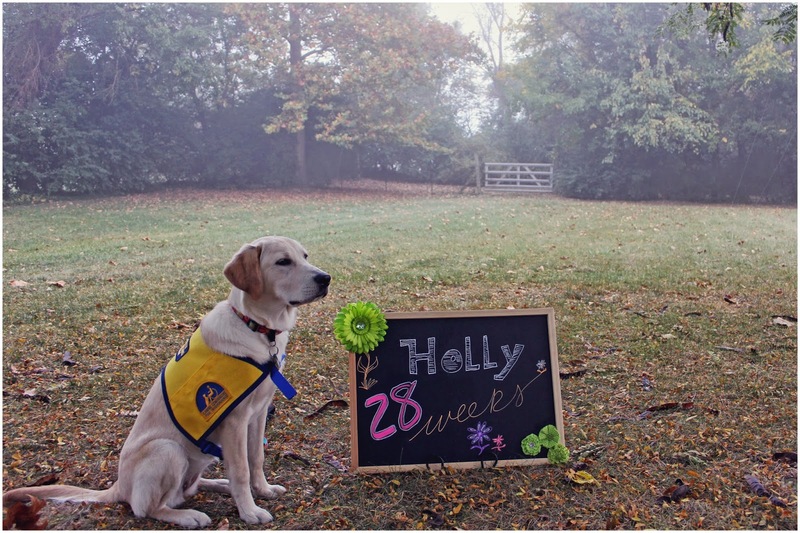 Posted in Dogs, Watch Holly Grow and tagged Holly. Bookmark the permalink. At seven months old, Holly’s growth is more mental than physical at this point. I may be handy with the camera, but it’s a challenge to capture the essence of her gray matter maturing as it is. So now would be a good time to adjust the weekly Holly photos to a once-a-month kinda schedule. And speaking of the Canon, I should have put that word handy in air quotes. What is the number one rule of photographers? What? I don’t know. I was hoping you did. Anyway, one of the big rules is … watch your background. Don’t wait until you’ve uploaded your photos on the laptop before you notice there’s a pumpkin stem growing from your puppy’s head. Or that rogue propane tank that’s messing with the mood of your fall scene. Propane tanks are so summer. And wait, what on dog’s green earth is that in the window? Son of a … that’s Cap’n Windy. How did she get on the porch when I had her decorating the living room in her Halloween getup. Posted in Cap'n Windy, Holly, Watch Holly Grow. Bookmark the permalink. Let’s save some time, says Holly. Just put the treats … here. And this is how you train the trainer, people. Another weekly photo shoot and a pocket full of dog cookies. Holly is learning to respond to Cookie! as well as she does her name. We’ll be weaning her from this expectation now. I mean, for goodness sake, the pup knows how to Sit and Stay. And to look at the camera on cue. It’s just that the cue is a dog cookie. 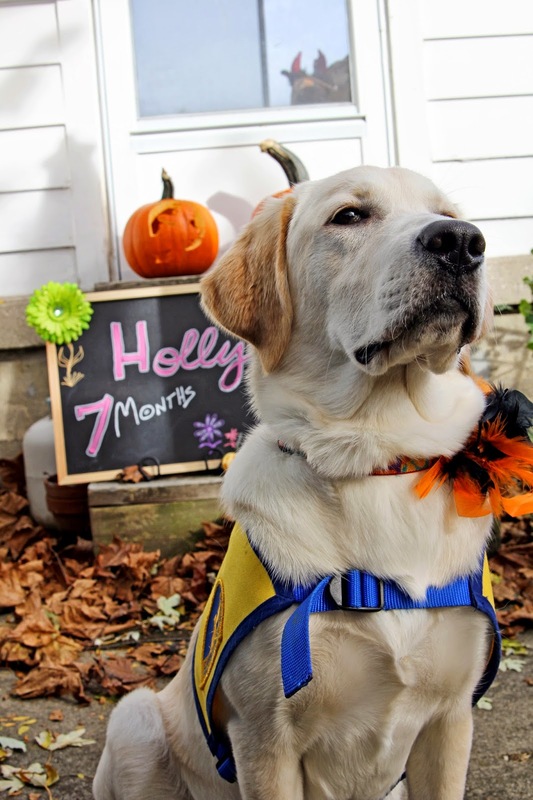 Holly can certainly work it for the camera with the proper motivation. Here she is in a Nice Sit/Stay, all alert with ears perked. Because I’m making wolf howl-y noises to keep her attention. You just gotta go with what works in this gig. By the way, check out last week’s photo to see our nearly leaf free backyard. Thanks to the sycamore, with leaves as large as dinner plates, we get to witness the very act of season falling upon us. Want to see a comparison for these weekly photos? 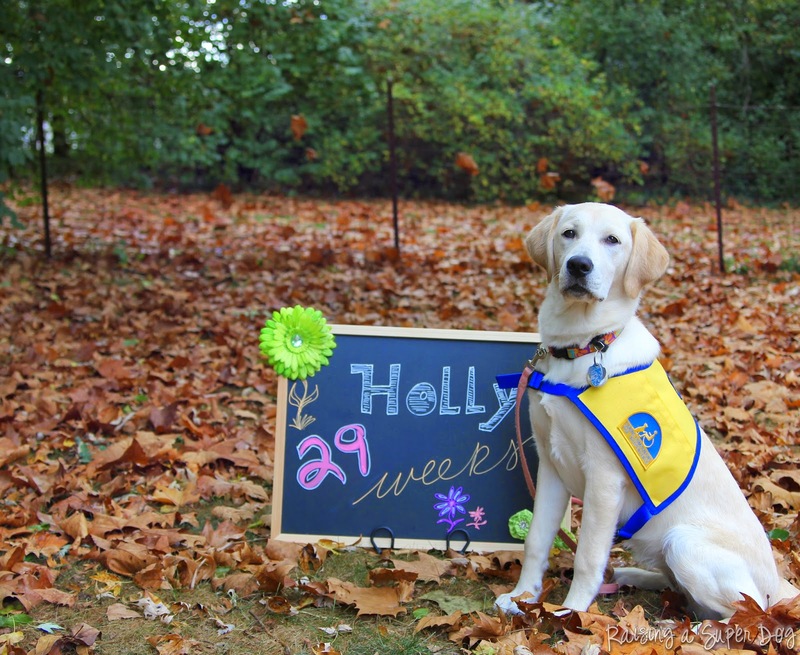 Give this link a click to Watch Holly Grow to see the past posts. Posted in Holly, Watch Holly Grow, Wordless Wednesday. Bookmark the permalink. How cool is that, I think as I check the morning weather by way of the west facing kitchen window. A foggy dewscape this morning. I wipe the sleep boogers from Holly’s eyes and walk her outside with an edgy and mood laden photo in mind. And instead get a rather underexposed shot for my troubles. But no matter. We’ll wait things out for this week’s birthday photo. And a few hours later, I wipe the sleep boogers from Holly’s eyes for the second time today as she awakens from her afternoon nap and we once again head outside to the awaiting blackboard. And we find that the Golden Hour offers up a backdrop that’s a bit more uplifting for our sunny girl’s personality. Twenty eight weeks old now. Welp, back to repurposing the buckeye stump as our weekly birthday photo prop. I had to have The Husband take the chain saw to it to give us a clean slate, so to speak. Funny thing that the chalkboard markers don’t wash off the tree stump. Didn’t say anything about that on the package. And there’s some sort of post-apocalyptic vibe about this photo. Do you feel it too? 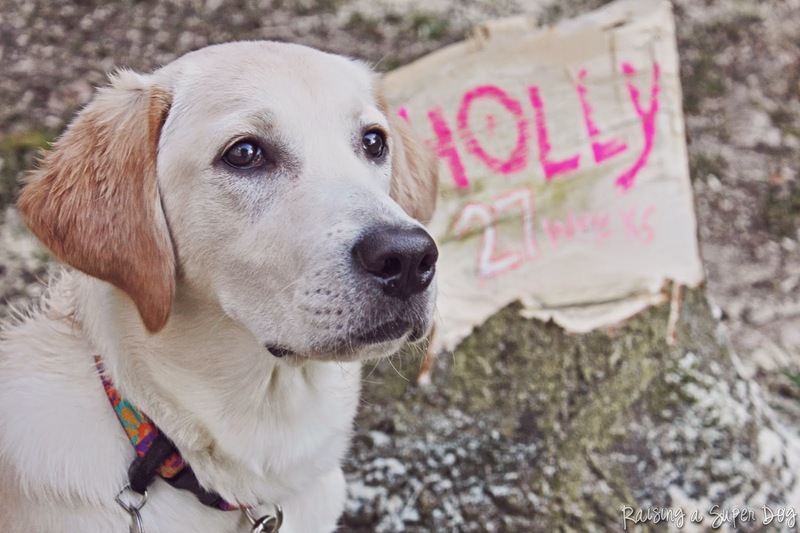 Holly’s ruffled fur and the rustic, damaged backdrop beg for a back story. Her intensely focused eyes have that hungry I could eat that look. True that, as there be a dog cookie suspended nearby to hold her attention, as witnessed by the reflection in her deep brown orbs. Speaking of, did you know that, if left to their own resources, a dog would eat sawdust? It’s my daily fiber, says Micron. Spit it out, says I. Well, you know what they say around here. When life hands you a lemon, you add a lime or two and make yourself a nice, chilled Sangria. And then you sit on the patio and make a toast to the memory of your favorite Buckeye tree. [sniffle] I loved that stupid tree. We knew the buckeye was a goner after the trunk split from windstorm damage back in July. And The Husband took the chainsaw to the rest of it. Right down to the nub. Anyhoo, nothing to do about it but make a photo op outa the thing. 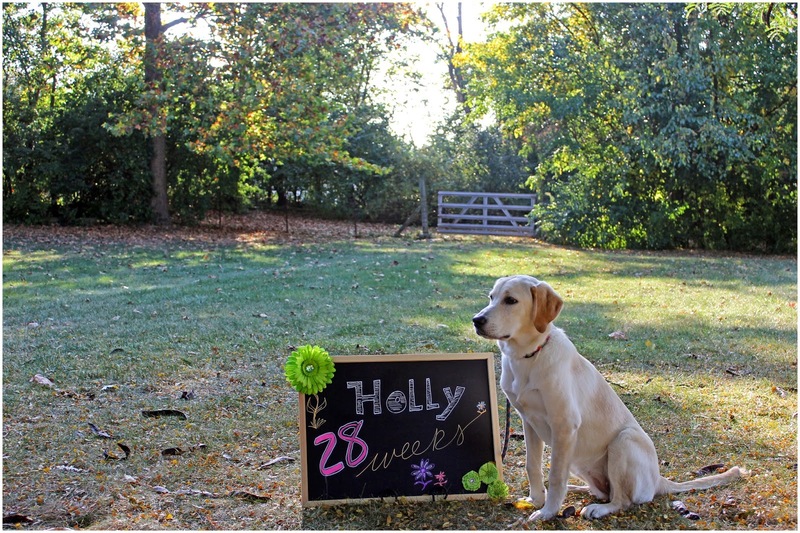 In lieu of the blackboard this week, we gotcha Holly stumping her twenty six week birthday announcement. 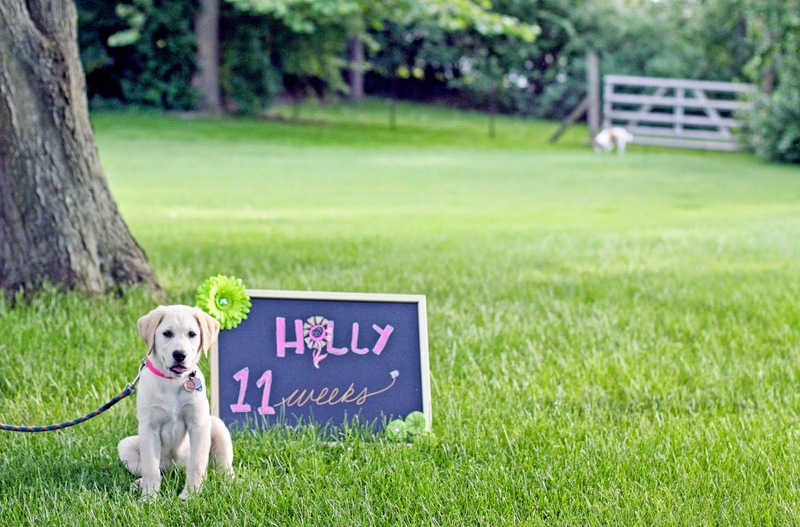 Posted in Hero Litter, Holly, Watch Holly Grow, Wordless Wednesday. Bookmark the permalink. Holly poses for her weekly shot at the scene of Micron’s misadventures. She is doing a fine job of turning her head away from the delights found in one’s patio herb garden. No noshing upon the cherry tomatoes or jalapeno peppers. Sure, it helps that Micron ate them all already. Still, some credit is due here. She didn’t even look for anything to roll around in her mouth. Need a comparison for these weekly photos? 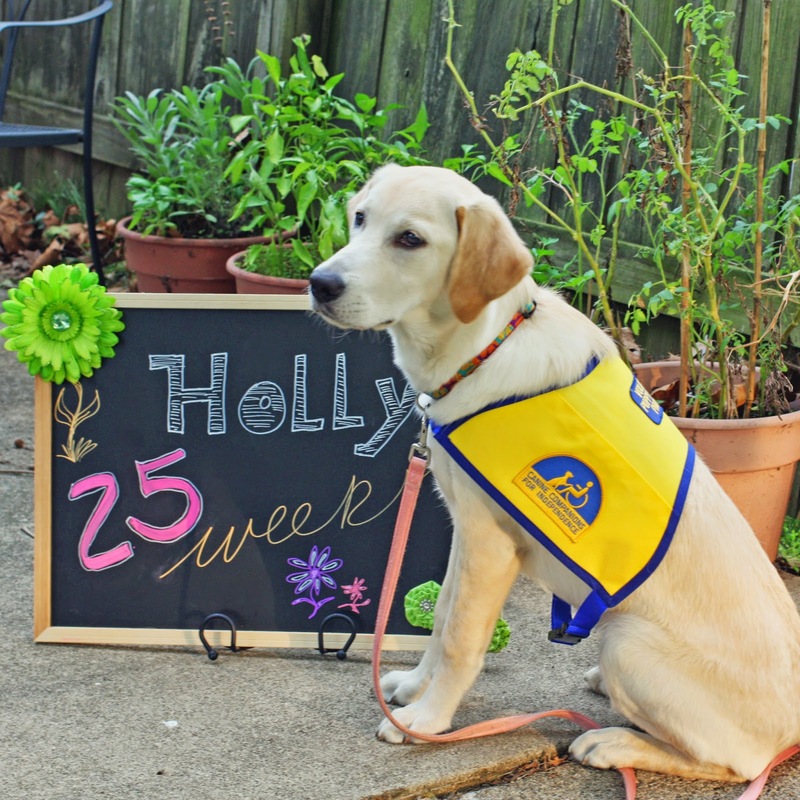 Give this link a click to Watch Holly Grow to see the past posts.